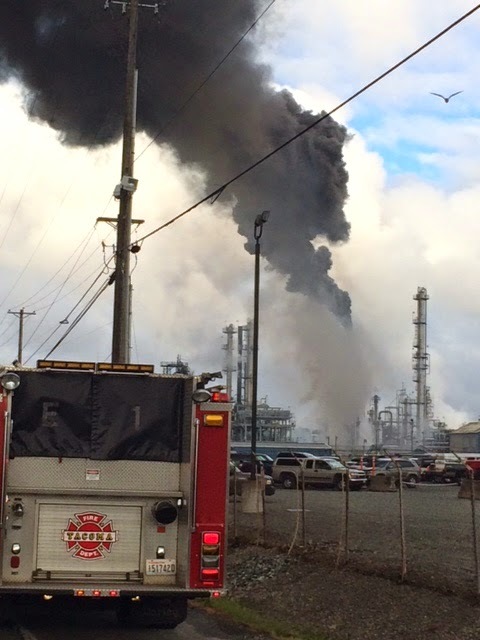 At 7:20 am firefighters responded to a reported fire in a heat distillation tower at an oil refinery at 3001 Marshall Ave in the Tidelfats area of Tacoma. The first arriving company found a sizeable smoke plume and fire in a large heater tank and tower used in the manufacturing process to convert crude oil into other petroleum products such as gasoline, asphalt and jet fuel. Operationally, plant personnel shut-off the flow of crude to the machine at the inception of the fire and efforts were directed at cooling the tank and nearby equipment to mitigate potential explosion or collapse hazards. After about 90 minutes the remaining crude oil in the tank burned itself out. The fire was contained to a single tower. The cause of the fire is under investigation and there were no injuries to report.